Six Feet Under are a band founded by ex-Cannibal Corpse vocalist, Chris Barnes. Formed in 1993 out of Florida, the group have been largely mocked over the years, the insults being more precisely aimed at Barnes himself, due to a plethora of lackluster releases that have showcased both rancid music talent and faltering vocals; the most notable among the hated being 2001's True Carnage, 2003's Bringer of Blood and an abomination called Graveyard Classics II that is a full album cover of AC/DC's Back in Black record. However, 2012 saw the release of Undead (reviewed here), which unimaginably brought Six Feet Under back up from the depths of the utter humiliation and shame that they have faced over the last ten years. Now, just a year later, the act have followed up with Unborn. The album marks both the tenth year anniversary of Six Feet Under as well as their thirteenth studio release. Does it follow the success of its predecessor? Most will remember Undead as a fairly good album that had a decent share of gripping moments scattered among a large portion of the track-listing it offered. Though Chris Barnes' voice sounded much more sturdy and powerful compared to earlier releases, his vocals could still be heard wavering with any elongated lyric or growl. Unborn has set out to fix this issue in the best way that it can, by sticking Barnes with short, somewhat quick, lyrical structures that sparingly have him extending words and growls. It can be said that his vocals sound much more refined and dynamic throughout the content, even to the extent where he nearly pulls off full blown gutturals in some tracks, such as "Neuro Osmosis" and "Decapitate". The vocals do find themselves overlaid at times, while the main track belts out rough, articulate death metal growls there is an infrequent backing track that comes in abruptly with mid-tone black metal shrieks; and let it be said that these black metal inspired segments are much more talented than what has been heard of Barnes previously. The vocal tracking on this material is probably as good as audiences are going to get from Chris Barnes at this point, they're still distinctive to only him but still yet they can be heard quivering under the weight of the octaves he pulls off; although, this time around it only occurs during the three or four drawn out lyrics that are present. I think that I even heard a pig squeal in the background of "The Sinister Craving". Yes, you read that right; a quaking one, but nevertheless a pig squeal from Chris Barnes. The lyrical structures are catchy and generally glue themselves to the rhythm guitar progressions, one of the best being heard on "Prophecy", and only occasionally branch out to stand on their own. One can also hear well placed pinch harmonics that are used to blanket some vocal errors. The overall sound of Unborn is close to that of what is heard on Undead. Rather than groove, there is a heavy presence of death metal consistently throughout each of the eleven tracks, however this time around there is a small trace of funeral doom thrown into the mix, as well as some rocking death 'n' roll compositions that edge their way into tracks such as "Zombie Blood Curse". The rhythm guitar dons a potent distortion as it chugs with crushing, down-strummed power chords that are partially palm muted at times and clear most often. As mentioned above, there are some pinch harmonics thrown into the tracks at only the most adequate moments, almost always seeming to come into play when Barnes' vocals may be hitting an off note. The lead guitar has more of a clean, ghastly tone to it that contrasts well against the grueling rhythm guitar. 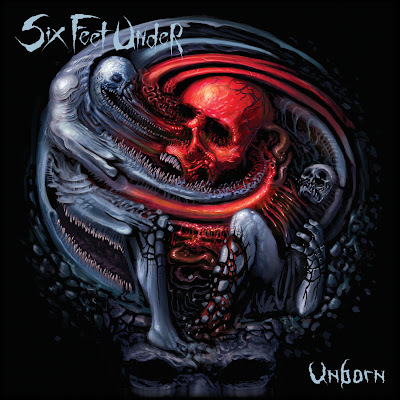 New to Six Feet Under is the incorporation of forlorn lead guitar melodies which are reminiscent of what would be heard in an Ahab album, though they are few and far between, making their most powerful appearance in "Neuro Osmosis", "Zombie Blood Curse" and "Decapitate". It adds a new level of never before heard depth to the band's material, causing the content to come across haunted and cursed. The few solos present within the tracks also convey the same funeralistic properties; especially the solo heard on "Fragment", which snakes its way smoothly from the background to the front of the track. Bassist Jeff Hughell is new to the line-up, gaining his first appearance on this release. His bass presence is roaring and lucid as he provides a flood of technicality which is underlain between the drums and rhythm guitar. "The Sinister Craving", "Inferno" and "The Curse of Ancients" are tracks where the bass really dominates, coming to the front of the mix with abstrusely composed lines. The drums are pushed pretty far back into the tracks, making them more underwhelming than they should be. They mostly stick to riding cymbals and hi-hats, there is almost always a crash heard in the background while either a tom or snare is being utilized in duet. Mostly, the drums contribute appropriate backing beats to the guitars with a few rolls, mid-tempo double bass kicks, blast beats and obscure patterns. The songs within Unborn aren't structurally as memorable as those that are found in Undead, however the talent progression that is heard surpasses Six Feet Under's previous effort. The content is also much heavier than anything the band have released prior. Listeners will find themselves enjoying "Prophecy", "Zombie Blood Curse", "Decapitate", "Fragment" and "Inferno" in particular. The album is a great follow-up that fails to disappoint, lets just hope that the group continue to go down this progressive route which has caused their sound to be more dynamic and concrete rather than sickeningly hollow. Highly recommended, mostly for those who enjoyed Undead and those that are still wary of Six Feet Under after their numerous failed attempts. Give this one a shot, you won't be sorry that you did.